"Eyes, noses, mouth, ear"..That was what the talking dog in my dream seems to be telling me though I don't exactly remember much of the dream cept of the mutt. I was wondering why the heck the dog seems to be muttering these word over and over again and jabbing my face with his paws..
And then I woke up. And there he was, with bright twinkly eyes and a cheekly smile. His little head was lying on the pillow next to mine and he was pointing his right index finger at the corner of my eyes..going "Eyes", moved it down too my nose, mouth and then ear, and naming them accordingly..and repeated the action even though I was wide awake by then. I couldn't possibly continue to sleep with Aidan all bushy eyed and wanting to play. It was 8am on a Sat morning! Actually, I should have known better coz I brought him over from his room to sleep with us on Fri nite as both hubby and I were quite busy for the whole of last week and got home late almost every night and couldn't spend much time with him. Had always missed him sleeping with us but it didn't occur to me that he would end up waking me soooo early! But it was still nice to wake up to his cute li' mug. He's more chatty now..:) He loves counting 1-10, saying the alphabets and singing/humming to himself..So far, I can never get tired of his voice. I guess it's coz he isnt at that stage where he's bugging me impossible questions and chatting non-stop. Got this from this month's Reader's Digest..
We brought our newborn son Adam to the paediatrician for his first checkup. As he finished, the doctor told us "You have a cute baby." Smilingly, I said, "I bet you say that to all new parents." "No!" he replied,"just to those whose babies really are good-looking." "So, what do you say to the others" I asked. Hmm, everyone says (yes, including his paediatrician) that Aidan looks like hubby...hehehe..
Not sure if anyone's following this year's Miss Singapore Universe pageant..There was an preview show last Sat where the finalists were revealed. Honestly, no one was outstanding and the main reason was because all the contestants paled in comparison to the host of the show,f Jaymee Ong (whether she's a good host or not is another story). she's really gorgeous! This is quite interesting though it could be considered old news to some of you... Some dude 'supposedly' fell head over hills in love with this babe in the iTune Pepsi ad that was shown during the Superbowl break..and he created a blog especially for her..as he went about trying to find out more about this 'shimmery' creature. Her name is Mandy Fujiko Amano (half Jap, half Irish) though she's now famous for being 'The Pepsi Girl' and some even called her the new 'Ellen Feiss'. Apparently, she's got 'legit comic fan cred'. 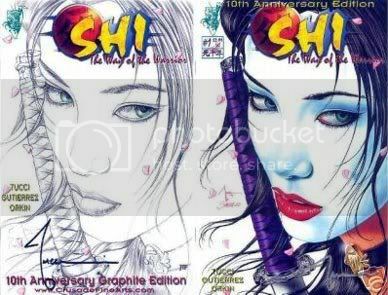 Her father is Jeff Amano, a writer-artist at Beckett Comics and her boyfriend is David Mack, creator, author and artist of Kabuki. She's even on the cover of one of the comics..
Well, she may be getting very popular soon.She reminds me a li' Jaymee Ong and Lee Ann d' Alexandry. The latter is a babe too.She's actually a former New Paper's New Face winner..I'll be doing this year's New Face event so it will be interesting to see what the quality of the contestants would be like.. Anyway..one gotta marvel at the power of blogs. It made Mandy more popular and received lotsa mention in the media and through it, Maxim was able to contact her and her interview and photo will be in it's May issue soon..No wonder some people think that this could be part of Pepsi's marketing - a corporate website in disguise as a fan blog..The creator of the blog did admit that he did it as a joke and made it really OTT just to get lotsa attention,which he sure did. heh i realised when i was out later that it was jaymee..i always get the 2 mixed up! they DO look alot alike. i couldn't tell them apart! how's his cough coming along? I mean, has it been ultimately been controlled without having to monitor it now? 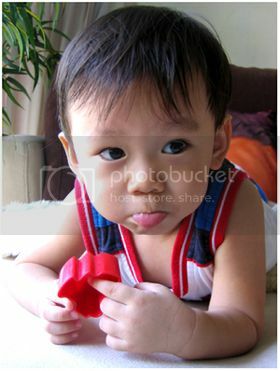 your question is so timely..He's down with flu again..phlegmy cough and runny nose. he's quite susceptible to it..but at least he's not wheezing and all. But nothing major to cause much worry. Thanks for asking! 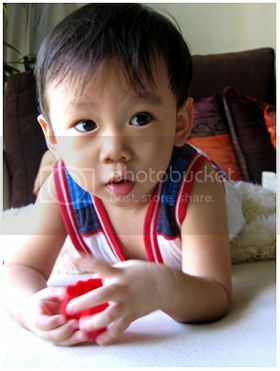 I tot Aidan looks like the 42er's Erin in the first two pix. See the resemblance in the eyes? Aidan seems to be fairer now! Is he? I saw the promo for Group 3... Yeeeeeeeeeeeeee. 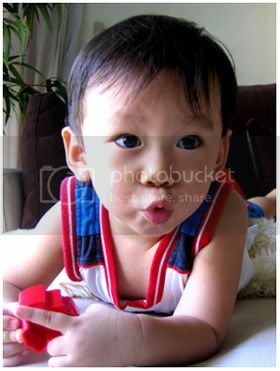 heh thanks :) I hope that if i do have a girl (if ever), she'll have his eyes n lashes too! i definitelt find that the host is much better than the contestant...kakakakaa & truely Jaymee & Lee Ann are equally pretty & talented. yeah..both Lee Ann and Jaymee are gorgeous :) they do have the 'typical' pan asian look which we usually see in the media..
so adorable of Aidan to do that. Just imagine if you dreamt the dog slurping at your face.. LOL. Jaymee's face is all over town and if she can host the show well, she should be nailing the Miss Universe award. Most (if not all)of theMiss Universe candidates really should display some x-factor cos none has "it". X-factor..*sigh*..tough to find that element in our pageants! Hey, I happened to stumble across your blog and I noticed you mentioned the New Paper New Face competition...and what really caught my attention is that you said you're going to be doing this year's event? Lots of people I know happen to join it and it's a very big thing, especially in a schoolgirl's, such as mine,life. And I was wondering, what do you think of last year's winner, Stephanie Ang? I'm quite upset over how the judges seem to favour Pan-Asians and eurasians over the rest. The winners are picked by (modelling) industry pple so they basically chose the winner based on her potential as a model and how successful she can be commercially. I guess unfortunately, its the pan asian models that tend to do better..good examples are Lee Ann Alexandry, Lee-Mei Curdy who both are considered successful..For last year, it was quite obvious (to most of us) that Stephanie would win or end up being one of the front-runners, not because of her mixed heritage..but more that she stood out due looks, height and poise. For New Face, most of the girls are really newbies in the modelling industry and its the first time they pose and walk and many arent used to doing catwalk/in front of cameras. I know the cameramen and stylists usually have problems although there will be some who are q natural. One thing abt New Face is that it is not a contest for Singaporeans..its open to pple from overseas coz the ultimate aim, eventually is to look for a (photogenic) new model..not for a Singaporean/Chinese model..
Me, join? Ah I highly doubt so. firstly, I'm having a major exam around that period, O levels would be a few weeks after the finals...too time consuming. And I don't think I meet the height requirement..I'm a shorty, standing at 163! Haha...And even though I'm of mixed heritage, I prefer not to harp on about it, lest some people think I'm arrogant, cause that's the general idea I have about most eurasians. Alot of girls my age are conscious about appearances and the pressure to look good is just so high! It really does take its toll sometimes.